we do what we should. After a year and a half of work, the finished book is finally in hand, my newest: In This Place: Selected Poems 1982-2013. It started as a 14-inch thick pile of manuscript, and has ended as a 392 page compilation of what I consider the best of my work 1982-2013. It doesn't include any of my Ben Zen poems, nor any of my The Old Poet Says series, but I picked through everything else (with Mary reading the manuscript in four different stages and making further suggestions) and came up with this selection. It is the best I can do, and I have to say that I'm proud of it. 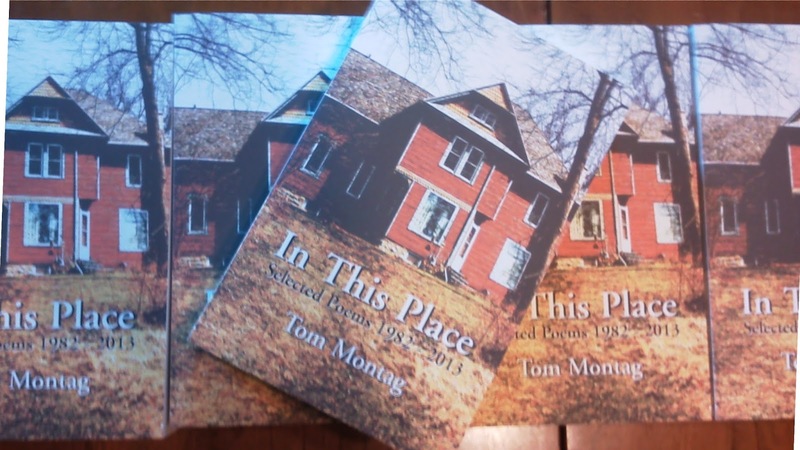 You can order copies directly from me at PO Box 8, Fairwater, WI 53931. The cover price is $25, but if you are a needy poet or otherwise unemployed, or if you want to order more than one copy (it'll make a great gift) or to use it as a textbook, I can make you a special offer. Contact me at: tmmontag AT centurylink DOT net . Sometimes you can't see it whole, what you imagine, so you report the parts you can see. What doesn't make sense now will make sense tomorrow. If we don't have this trust, we're lost, and this is all for nothing. flap of laundry on the line. Many of us, when we start writing, may think every poem is precious. And every poem is, in that each of them brings us to the next poem. Yet, looking back, I see that the first 200, the first 500 poems were simply preparation. You have to do them, but you should throw them away; they are only good to get you to your real work. As unimaginably painful as it is to put aside those first poems, we won't find our good poems until we get past the carcasses of all the bad ones. Some writers have a grand plan - they know what they are going to do and how they are going to do it. Others of us fumble in the darkness, trying to find the tail of the tiger, any tiger, to see where it takes us. Our only plan is to hold on, and to keep holding on as long as we can. Ink on the page, the blood trail. It is enough for now, this waiting to be torn apart. Perhaps those who do not write can understand things too quickly, too easily. I have to stand and stare, and then sometimes I still don't get it. For me, patience is important; indeed, it is essential. Very slowly pattern emerges from the background of chaos and I begin to see and understand. I had an odd mixture of support and loneliness as a child -- the love of a large family, yet a terrible desolation as I'd stand among the trees in the grove, looking west at the setting sun on the far horizon. That unbearable longing is what made me a writer, I think. I think teaching writing is not so much a matter of "teaching" as creating a space for students to read and to experiment with words, then encouraging them and helping them find the discipline to continue trying. Writing can't be "taught," but it can be learned as the student reads and writes and reads and writes and gets pushed to look at possibilities that he/she may not have considered. The teacher cannot be a "guide" in the traditional sense, since none of us know where the student is going; the teacher can be an inspiration and a metaphor for the writing life. In some ways I am getting better at paying attention. I noticed this year how the birds went away from the bird feeder for about a week, and now they've come back. I didn't see that last year. I noticed how the mountain locust west of the house and the walnut northwest of the house have leafed out more slowly than the other trees. I noticed the wild whirlygigs of the maple trees seeding the universe. Small things, but important to see and to put in context. I noticed morning light high in the trees, before daylight reaches the grass. The light is there, high up, and then - soon - it is everywhere.